I’ve spoken about Krark-Clan Ironworks on several occasions now, but continued testing has reinforced my belief that many Modern players don’t really understand how it works. The combo itself is incredibly complicated once it gets going, and as a result, players frequently misplay. But the strategy’s true strength isn’t its density, but how much Engineered Explosives does for the deck. KCI’s main components have always been part of Modern, but the deck lay low until recently. The first version made Stanislaw Cifka take too long winning Pro Tour Return to Ravnica in 2012. When this problem proved to be a feature and not a bug for Eggs, Second Sunrise was banned. Eggs didn’t have a noticeable presence again until five years later, when Matt Nass won GP Hartford last April. It’s easy to point to Scrap Trawler as the reason. However, Trawler had been in Modern for over a year at that point. There is more to the evolution of Eggs into Ironworks than that one card. I’m not saying that Trawler didn’t have an impact on Ironworks. Arguably, its existence is critical to why Explosives is so powerful in Ironworks. However, Trawler alone didn’t bring Ironworks to power. Ironworks spent 2017 on the far edges of the fringe. For that year, it wasn’t any better than the Eggs decks it evolved from. I would also argue that the benefits of Trawler are balanced by its negatives. The biggest plus for Trawler is its cost. After Second Sunrise was axed, Eggs came to rely on Faith’s Reward and Open the Vaults to rebuy its artifacts. Their higher costs slowed Eggs down slightly, but mostly made it far more vulnerable to countermagic, a huge contributor to its decline. Reward had to move from reserve to primary enabler because the only other option is a six mana sorcery. Prior to the ban, Eggs could play around UR Twin’s Remands because everything was cheap. That wasn’t true with Open the Vaults. 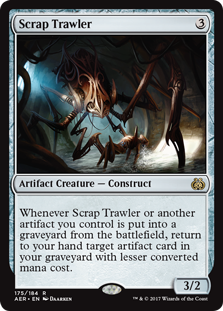 Additionally, Trawler returns artifacts to hand rather than to play, which is a neutral feature. It’s good because it facilitates a single Engineered Explosives completely clearing opposing boards or loops with Mox Opal. But it also makes Ironworks more vulnerable to Damping Sphere or Rule of Law than Eggs was. Trawler has above all added complexity to the deck. Eggs had to keep track of all the draw triggers and floating mana. Ironworks has to do all that plus remember Trawler and Myr Retriever triggers. Eggs didn’t care about the order of sacrifices, but Ironworks can lose to poorly stacked Trawler triggers. All this accounting means that Ironworks demands flawless play in a way that Eggs didn’t, with the penalty being judge calls for many missed triggers and failures to maintain game state. It has become a deck like Amulet Bloom that only committed players can play consistently well. The addition of Trawler and the transition from Eggs to Ironworks are not the key to the deck’s recent success. I believe that the adoption of Engineered Explosives is. Looking back, the initial Ironworks decks ran one Explosives; maybe two. Eggs rarely ran any in their 75. However, ever since Hartford, three has been the norm. My Ironworks opponent in Week 1 had four. This is the real game changer. 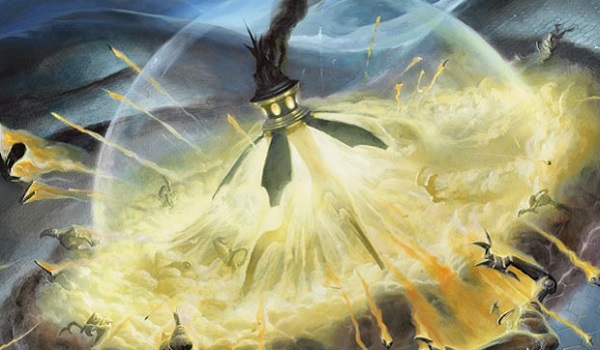 Sunburst makes Explosives it shockingly flexible, as Legacy Miracles players first discovered: it doesn’t matter how much mana was payed for X, but the number of colors, letting Explosives resolve through Counterbalance locks. Sunburst also means that taxing effects don’t work. Thalia, Guardian of Thraben does nothing to Explosives, while she does impact Chalice of the Void. More importantly, Explosives hits all non-land permanents, including every hate card but Stony Silence. Normally, an engine combo like Ironworks is effectively dead to Meddling Mage naming the engine card. I certainly won plenty of matches Maging Eggs years ago. Explosives neatly answers Mage, and almost every other good card in Humans. Take note, ramp players: only Ruric Thar, the Unbowed is unsolvable for most Ironworks decks, as Explosives answers all hate cards that cost less than five mana. Thus, Ironworks is far less vulnerable to hosers than it was in the past. On top of all that, Explosives is an artifact and can be played for free. This means it is never dead. It turns on Mox Opal, feeds Ironworks, and finishes the Trawler chain for value. Trawler means it can be played early to set up Opal, then sacrificed and brought back to remove troublesome permanents. It does everything that Ironworks could ever want. Normally, answers in combo decks don’t mesh with the rest of the deck. Abrade may add to storm count, but it doesn’t actually further the combo, because it doesn’t provide mana or draw cards. It may be dead if its intended targets don’t show up. Furthermore, adding answers tends to dilute combo decks, making it harder to actually go off. Since combo became a thing, combo players have been warned not to over-sideboard and turn their deck from combo to a bad fair deck. I remember Jon Finkel saying in a Storm deck tech years ago that the sideboard was there only to make his teammates happy. Given the choice, he never sideboarded in Storm; if he did, it was only to go all-in on Empty the Warrens. Explosives doesn’t have that problem, as it fits almost perfectly into the combo. The closest direct analogue for Explosives’ integration with the Ironworks combo is Angel’s Grace in Ad Nauseam. Grace’s main purpose is to facilitate using Ad Nauseam to draw the whole deck, finding a win condition and the means to execute it. It has the ancillary benefit of preventing opponents from killing you, but it isn’t perfect at that; just ask Infect. Ad Nauseam also pays a heavy price using Grace in that role, as there are only four in the deck. Combo decks tend to draw out the mania among Modern players, regardless of data or power level. Right now, the data demonstrate that Ironworks is Tier 2 at best and not a problem by any stretch. However, this hasn’t stopped commentators from picking sides. Mox Opal and Ancient Stirrings are the chief targets of player ire, but this is entirely unjustified. The problem isn’t with the deck’s power level, but that Explosives has changed the nature of the deck and players have yet to adapt. The argument against Opal centers on it being free and accelerating the deck. Casting Ironworks a turn early provides a huge advantage. Skimping on land is also beneficial for any combo deck, and Opal makes it relatively painless. However, none of these factors point to Opal being particularly overpowered in Ironworks. This is Modern, in which interactive decks have plenty of ways to counteract even the strongest Ironworks starts. It can be rough on decks that want to goldfish their opponents, but that is the price that has to be paid. Failing to have the means to stop fast starts is a choice, and not a reflection of Ironworks. Opal is also vulnerable to all the same hate as the rest of the deck. Players have argued to me that Opal facilitates the best Trawler loops, but I don’t find that argument persuasive. If Trawler is looping artifacts, Ironworks is winning. The relative efficiency of the loop only matters if Ironworks gets bottlenecked. Yes, Opal is effectively Black Lotus mid-combo, but how often does the extra colored mana actually matter for the Ironworks kill? Especially with all the Chromatic Sphere activations in a typical loop? It’s a nice bonus, but not a critical component. Remove Mox Opal from Ironworks, and the only effect will be to reduce the explosiveness of its best hands. It will not dramatically affect the average Ironworks win speed because the deck must still find Ironworks. If the effect is really necessary, there are other options available like Lotus Bloom that will fill the niche. On the other hand, there’s nothing that can fill Explosives’s shoes. Oblivion Stone is far slower and can be a liability. I’d argue that thanks to devoid, Stirrings is the best cantrip in Magic. It looks five cards deep and finds whatever the decks that utilize it need. This gives them consistency that far surpasses colored decks and is a huge contributor to Ironworks’s success. Removing Stirrings would noticeably weaken Ironworks’ ability to find its namesake card, and that translates to more games lost. However, I doubt it would be that dramatic of a drop-off. There are plenty of other options available, from Fabricate to Conjurer’s Bauble. They’re all worse, but again, everything is worse compared to Stirrings. Cantrips make decks more consistent. Combo decks need consistency more than any other deck because they have pieces to assemble. However, they don’t win games by themselves, nor do they turn games around. In a tight spot, Stirrings is only a good topdeck because it provides the best chance of finding the Explosives that will actually save the day. Let me be clear: Engineered Explosives is not bannably powerful, nor does Ironworks warrant any bans, my hatred of Stirrings notwithstanding. The only reason the deck will eat another ban is if it causes GPs to drag on forever again. Instead players need to focus on countering the effectiveness of Explosives. Players know that Ironworks is vulnerable to Stony Silence, graveyard hate, and not resolving Ironworks itself. The problem is most of the good options for fighting Ironworks all cost two mana. I’ve seen Humans scoop to losing Thalia and Mage in the same blast. Normally, it’s a bad idea to run anything but the most powerful card but given how Ironworks operates and how it sideboards, this is a time where less than optimal cards may be more potent. The conventional permanent based attacks won’t work against the new version of Ironworks. It’s time to rethink and reposition. A solid strategy for dealing with answers or hate is to be less vulnerable. Since Explosives is set to a specific mana cost, the simple way to avoid getting blown out is to use differently costed hate cards. All the most powerful cards cost two mana, but that doesn’t mean there aren’t perfectly serviceable cards available, such as swapping Rest in Peace for Leyline of the Void. Shifting from relying on a single mana cost denies Ironworks the chance to solve all its problems with one fell swoop. Make Ironworks work harder, and it is likelier to stumble. One option that I am exploring for my next PPTQ is Trinisphere. It is harder for Ironworks to produce three colors of mana than two, and Three Sphere has the advantage of weakening Nature’s Claim. Trinisphere is far more narrow than the Damping Spheres I’m currently running in Spirits, but has about the same impact against Storm and plays around Explosives better than banking on Sphere and Rest in Peace. The more straightforward approach is to simply moot Explosives. Grixis Shadow uses non-permanent disruption. Ironworks doesn’t really have an answer to discard spells, a fast clock, and countermagic. True, relying on discard leaves players open to losing to topdecks, but that’s why a clock is critical. Even the slowest UW Control deck can drop a Vendilion Clique end of turn and then hold up counters. To not lose to Explosives, don’t make it matter. The other option is to play permanents that Explosives can’t hit, but the only one I can think of is Ruric Thar. As mentioned, he’s a nightmare for most combo decks. The only way Ironworks can theoretically answer him without taking 6-12 damage is double blocking with Scrap Trawlers. Blocking may be the only option because how likely is Ironworks to bring in Galvanic Blast against ramp decks? The other option is to simply preempt Explosives. Humans has Thalia, and she is very potent against looping artifacts. Instead of using Mage to name Ironworks, name Explosives. This protects Thalia and preserves the board; a second Mage should provide the nail in the coffin. Another option is Pithing Needle. Needle normally does nothing against Ironworks because everything is a mana ability, but it does hit Explosives, which means it protects the real hate and may even draw Nature’s Claim away from another target. A far cleaner answer is Gaddock Teeg, who prevents both Explosives and Ironworks from being cast. Like most combo decks, Ironworks knows what it’s vulnerable to and has taken steps to strengthen itself. The reason that this is different from other combo decks is that the answer it needs meshes perfectly with the combo. Therefore players need to stop focusing specifically on the combo and look more broadly. Ironworks has adapted, and it’s time the rest of the metagame follows suit. What’s funny about this article is that I’ve been seeing Jeskai Ascendancy combo decks as of late doing the same thing with EE. It allows them to clear the board of any troublesome permanents while also going infinite with banishing knack or retraction helix. And I had the same thoughts that you expressed in this article…pure combo decks that get to run a powerfully interactive card as PART of the combo seem really powerful. It’s definitely troubling, but with some adjustments it should be solvable. The main problem with both decks is how long it takes them to actually win if the opponent doesn’t concede. great article and very thorough.